The fun thing about Venkat Subramaniam’s latest book is the way he jumps to and fro between a couple of JVM based languages: Java, Scala and Clojure. He shows interesting ways to do given tasks in different languages and introduces a couple of interesting frameworks I at least have not heard of before. The most interesting frameworks he shows are Akka, which is an Actor Based Concurrency Framework, written in Scala but which comes with an API that is just as well usabale from Java. 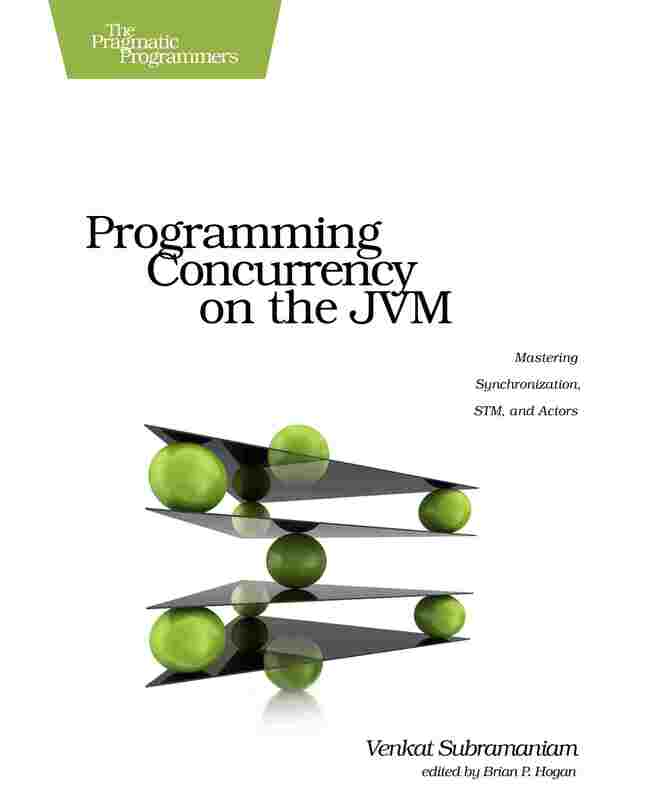 Furthermore, I knew the concepts of Software Transactional Memory but did not know that there are working implementations for the JVM. One of them beeing Multiverse. I really liked the book, because I really like the idea of using a framwork implemented in Scala through its Java API in Groovy. Sometimes it gets quite tiresome to have many of the same examples just shown in different languages, but it is always good to practice Scala or Clojure reading skills. If you feel safe in Java concurrency, i.e. you now Concurrency in Practice by heart, I warmly recommend this book. Google Merchant is the way a company can feed their products into Google Shopping and ROME is a Java Library to create and parse RSS and ATOM feeds. Google Merchant allows RSS as one of the feed formats you can use to feed them their data. In order to get additional information into ROME created feeds you have to implement 4 classes, so it is not really easy to get your data there. It’s under MIT License up in Github, you can direct download the Version 0.1 here. So, by now everybody got it: Code is there to be read by people, to be analyzed by people and to be understood by people. The fact that you can put it through a compiler and run it is a nice sideffect, but nothing to focus on. Besides writing readable tests of course. I like to be able to read a line of code like a line of text. Which means that I at least want to be able to get the “words” without the surrounding context. So what would you be able to tell about the above snipplet? I would say: it apparently creates a new user, using some service and it requires an email and a password, which might be stored somewhere. And the point that makes me cry: apparently some magic flags, a nullable parameter and a magic number. So lets see how we can clean this up with some new patterns. I usually make up my own names, if someone has a rather more common name for them feel free to comment, I will be happy to replace them. So, what can you tell about the method call now. The problem of methods that react to flags aside, the readability is better. You at least can deduct now that there might be no error if the user already exists and that it uses the “new” password checks. It is even easier to refactor to use the third password validation algorithm should it ever be changed again. When setting up a new project you might try to disallow all boolean literals in certain high level classes, I don’t know if it works that well with third party libraries. This might be a cool Checkstyle rule to try. So what is my next problem? Well, the given null parameter value. I believe that the ability to cope with null values is an implementation detail that belongs in the class that defines a method. So the UserService interface should provide us with an overridden version createNewUser that does not have the fifth parameter. Then the implementation could hide the fact that this parameter is really nullable. And it avoids the clutter of methods that have n optional object parameters. If you use Findbugs in combination with the great JSR 305 annotations, which by the way can be enforced using a Checkstyle plugin, you might try to disallow using the Nullable Annotation in public methods. Maybe even for protected methods. In any case, you should never have to use a null parameter while calling a visible method of another class. The last thing is a classic, but there are still a couple of people who do not use constants instead of literals. I think the general rule is that you should never use a numeric literal inside a method, but always a class declared constant. Furthermore this might even be extended to be valid for String literals and as told in the first point to boolean literals. Given that you might see this lines of code during a review, where you can’t browse the complete source of your project, one might now be able to better understand what this method does: it creates a new user with the given email and passwords, succeeds even when the user already exists, uses some mythical new password check and gives him an initial number invites of five. This can be guessed by just reading code, without a single line of JavaDoc and even without once visiting the declaring class or interface. So in future, when writing code, try to consider if you would understand your method calls without ever having seen the implementation or even the declaration of the called method. This happens again in the UI layer. You usually do not have per layer logfiles, as this would make it harder to see the flow of the application. But when you log the exception on every layer, it leads to a lot of log clutter. The best way is to define a layer that logs the exception, the business layer being the obvious candidate here. Thus you have a defined way to handle lower layer exceptions. This pattern does not appear that often anymore, as unchecked exceptions are generally considered the better solution today. The two versions of the Fail Silently Pattern have the same problem: you will never know that an exception happened. Combined with the fact that Exception is caught all kinds of runtime problems can be hidden. Usually, you should always catch specialized exceptions that you expect and can handle. If you’re doing frameworks or using libraries that might throw all kinds of exceptions, or you write handling code that needs to handle all kinds of exceptions on some way you still must log what is happening there. Otherwise you will never be able to explain certain behavior in production. And an exception handling block should never return the same value as the usual code path. After all it is an exception handling block. There are two simple rules when handling exceptions: always log the exception including the stacktrace and always include any data which might have lead to the stacktrace. I still see it today that people discard all information directly at their fingertips to log out what they think might have happened at that point. Or what they have expected to happen. Together with to wide catch clauses this leads to the problem that you do not really know what happened in production, you just believe you know. Even worse, you might stick to assumption someone else made about the error at the point. So when you write a try-catch-block, always see that the variables used in the try are also logged out in the catch. This is somehow the worst case of the above mentioned pattern. Here not only the wrong information is logged but it is used to create error messages. This might lead to all kinds of wrong behavior. Just because you know that a certain layer or lower level function behaves in a certain way does not make it an interface. Maybe a different exception is thrown, maybe something else went wrong. As usual, these points are open for discussion. But I believe that these are some general rules everyone needs to apply when writing exception handling code. Wenn man mit Java OAuth machen will Benutzt man Scribe. Nicht nur weil ich da noch eine Pull-Request offen habe, sondern weil der API sehr schön ist und Spass macht und einfach zu benutzen ist. Ich wollte eigentlich sowas wie einen Hafas Client schreiben, die Bahn sagt aber immer 500. Dabei habe ich gefunden das Andreas Schildbach, der Autor von Öffi, seine Client Lib auf Google Code hat. Kann man bestimmt auch mal benutzen. Die PCollections die auch auf Google Code rumliegen sehen so aus als wenn ich sie mal gerne benutzen würde, auch wenn ich nicht verstehe warum man immer noch die 15 Jahre alten Collection Interfaces implementieren muss. Leider hatte ich nichts was ich auf Anhieb damit machen würde, habe aber mal eine Implementierung in meinen Collections ausprobiert. Des weiteren habe ich noch gelernt das man auch von zwei Erkältungsbädern nicht wieder gesund wird. Und das WordPress viel leichter zu Updaten und zu Administrieren ist als vor 3 Jahren.